Walking inside, it’s a friendly little place, and the owner, Iwona, immediately greets you in the manner than only an older Polish matron can; a hearty welcome and some immediate encouragement to sit down, relax a bit, and, most importantly, get some hearty food in front of you. 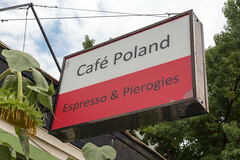 Columbia, MO isn’t exactly the center of Polish-American, so it was rather interesting to learn how Iwomna made her way from being a farmer in Poland to running a Polish Cafe (for those that want the details, there’s a rather nice article on Vox Magazine’s site). And when I say it’s a little place, I mean exactly that: it’s got a serving counter, a few stools, and a handful of tables, and that’s pretty much the entire restaurant. But they also do a brisk business in takeout. The menu is simple, it’s basically a combination of your basic takeout coffee joint with a daily-changing selection of Polish food, with a selection of pierogi, soups (including borscht), bigos (a sauerkraut and meat based stew), ghoulash, and golabki (cabbage rolls). I’ve always got a weakness for pierogi, so we ended up ordering a mixed plate of cheese and potato and cheese and bacon pierogi, as well as a dish of bigos to share. A few minutes later, we were enjoying our plate of pierogi fresh from the steamer. 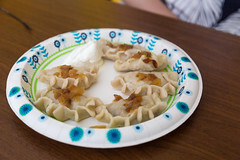 Immediately, you could see that these were going to be good, instead of the more usual half-moon folded-over crescents, each was a very carefully folded and crimped dumpling. Each had a very flavorful and just barely toothsome dough exterior, surrounding a flavorful cheesy core mixed with either bacon or potato (we enjoyed a few of each), with each bite giving you just a little bit of dough and some of the hot filling. 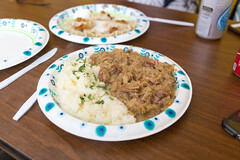 The bigos was a nice follow on, with a very hearty portion of a slightly spicy beef, pork, and sausage stew with a hearty amount of sauerkraut mixed in to give it some cabbage flavor and a bit of fermented tang. Combined with the fluffy mashed potatoes it was served up with, it was a hearty and flavorful stew of the variety that almost makes it were winter outside (we were visiting in the fall). Another thoroughly enjoyable dish. Like any sort of good ethnic restauarant, Cafe Poland left me longing for more; I’m hoping on a future visit (hopefully with a shorter interval than last time) I’ll be able to try out their borscht and golabki, since those looked rather tasty as well. In any case, it’s a very friendly and affordable place to stop off for a breakfast or lunch that’s a nice changeup from the usual.